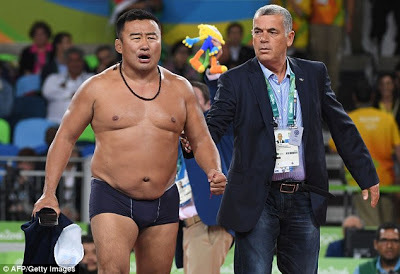 Two Mongolian wrestling coaches stripped off their clothing to protest the result of a bronze medal match, a bizarre turn in a day where officiating was highly-criticized. 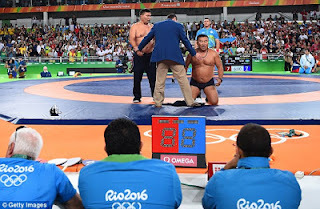 The scene began after Uzbekistan's Ikhtiyor Navruzov appeared to have lost to Mandakhnaran Ganzorig 7-6 at 65 kilograms on Sunday. Uzbekistan challenged the scoring, believing that the Mongolian was fleeing instead of fighting because he was running around in celebration with less than 10 seconds left. 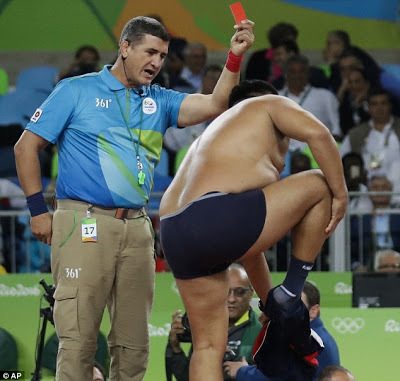 Navruzov - whose quarter-final match resulted in the dismissal of all three officials involved after a questionable late call - won his challenge and the match on criteria. 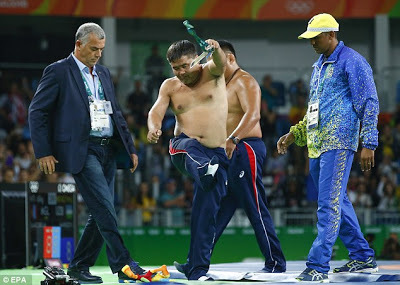 Ganzorig, who had already started celebrating, fell to his knees in disappointment. 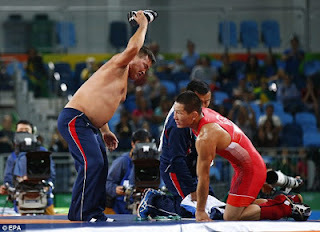 The Mongolian coaches went much further. Byambarenchin Bayaraa took his shoes and shirt off and threw them to the mat in disgust in front of the officials.